So I have just about bust a hole in the only pair of jeans I have that fit--not good--and I only buy jeans from Old Navy which doesn't exist in the UK. I'll be home in less than two months but hopefully in that amount of time I can lose enough weight (it isn't a ton) to fit into the next size down. In the meantime it means I'm doing everything I can not to turn that almost hole into a hole so I'm not wearing my jeans and I'm in a funk about most of what I have to wear. So instead of me this week you get Blondie Boy who always looks way cooler than I do anyway! My Mom sent this top over for Blondie Boy and I love it! I pretty much have loved just about all of the Harajuku Mini collection I've seen and I can't wait to stock up when I'm home in October. The wee buttons at the front are actual buttons which I think is just super cute and y'all know I have a thing for skulls. Blondie Boy also finally got to break out his Molo Jitterbugs; I freaking love these shoes. Not only are the tie-dye with sparkly silver laces but they are practical. There is a zipper on the side of the shoe so you can actually get the shoe on the toddler easily but he can't take them off easily-WINNER! Blondie Boy loved them so much he did a dance to celebrate. Yes he is dancing with a car. You'll see the same car in the photo above. He is OBSESSED with cars; if you watched his vlog on my post about our holiday in Carnac his favourite thing was the "holiday car." I have no idea why he loves cars so much but there is always one nearby so dancing with one isn't so strange to me. Little Stomper are currently having a Flash Sale so get the trendy toddler in your life some dancing shoes of their own! Have you entered my Panasonic Giveaway? It ends September 2nd and you could win a Lumix Digital Camera or Amazon Gift Card (open worldwide)! Can I just say I love his hat? okay, seriously?! that kid is ADORABLE. love it. he loves those shoes!! He is a dude! Love the t shirt... we've gone trendy toddler this week too! He is adorable. I have friends with toddlers and infants and I have bought them several things from that Harajuku line at Target. It's so cool! He is adorable,I love the top and the shoes too. My son is also obsessed with cars(and dinos) and is always carrying around at least one. Loving the Molo Hi-tops, now all I need to do is get Marky to wear something other than his damn wellington boots! I have a pile of clothes for you when you get here, if you want them. Too many to mail. Not sure if there are any jeans in there, though. Good luck with the jeans and weight loss. Such a cute little guy, all my boys love cars, dinosaurs and anything that makes too much noise. He is the cutest...I love the skull! How cute! He is so adorable!! I think you look fine the way you are but I do understand wanting to fit into your clothes better. Your son is so super cute! Adorable! I love Harajuku Mini for my kids too! I promise some world series memorabilia for BB when you guys are in the States (IF the Redlegs are so kind to us all). Yes :) He will proudly tell you he loves the Cincinnati Reds! I just LOVE it! My Mom sent him an awesome letterman's jacket too! Aw thanks Jeanine but I just know how to hide the weight well! 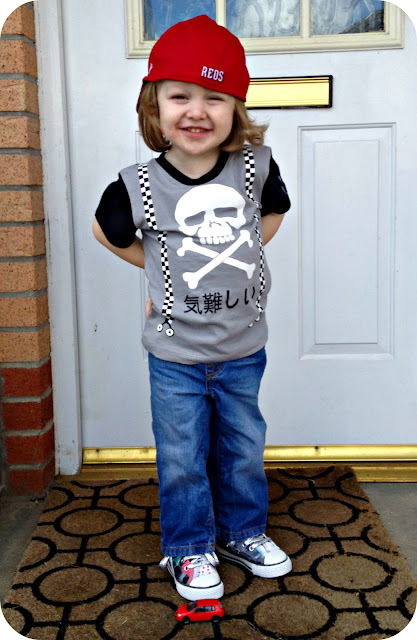 Boys clothes have gotten so much better from when I found out I was having a boy up to now. Such cool stuff now! There are totally some tops I wish I could fit into! The amount of cars in our house is INSANE. He also walks through parking lots and tells you what all the cars are--like he KNOWS the emblems. It is nuts. They are so cute. They are high up like boots so maybe he'd go for them? He takes a car to bed to cuddle. It's so bizarre lol. I wish it came in grown-up sizes! The Harajuku Mini line is SO awesome! I can't believe the Reds might make it to the World Series. I was a child the last time that happened. It's been too long! Oh my goodness! Such a cutie!! I think I was 10! It was 1990 right?